The Pharma Licensing Club Germany (PLCD) is an organisation for business development and licensing professionals in the pharmaceutical, biotechnology and healthcare industries in Germany. 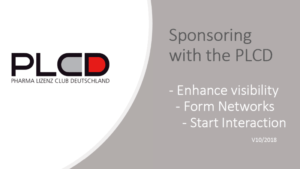 With more than 600 members in Germany and collaborations with the members of similar groups across Europe, Canada and Japan, the PLCD provides a unique professional network for the industry. Regular national and international meetings throughout the year offer opportunities for networking, partnering and information exchange on current topics, trends and best practices. In addition, the PLCD offers a comprehensive training programme consisting of business development seminars for beginners and for advanced professionals as well as workshops covering the many aspects of a business development function.